Not since Tobias Israel Swartz beat the Baltimore pavement peddling rags has a Swartz schlepped his pack of wares to a Jewish market. Well, tomorrow I will be selling my art (by proxy) at the Charlotte Jewish Community Center’s Levine JCC Marketplace. The event, I guess, is like a Hanukkah bazaar, with people selling arts, crafts, Judaica and so on. It’s all part of a larger event called the Big, Big Day at the J. Unfortunately, I won’t be there personally to man the table (I’ll still be up in Vermont), but my parents have kindly stepped in to do the selling. Still, you should come out and buy some prints/posters/stickers etc. And who doesn’t want to come say “Hello” to the Swartzes? I know they’d love to see you! So, come out to the J on Sunday, December 5th, between 10 and 3 to buy some art and meet the folks! This piece’s color scheme is very Crockett Johnson to me. Reb Harold must have sculpted this guy from his magic purple clay! 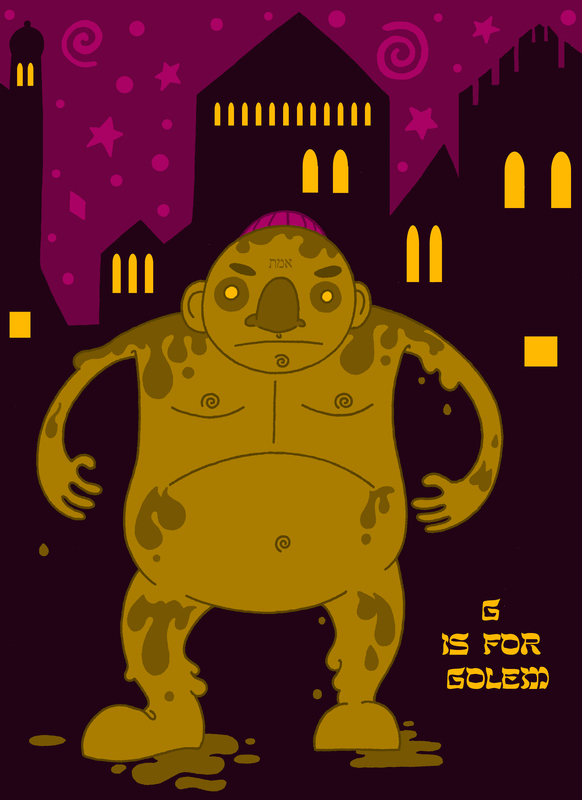 Anyway, I’m pretty proud of this golem and the little details I incorporated into this drawing. For instance, the rightmost silhouette is modeled on Prague’s Old New Synagogue, where a legendary Golem was said to have been made. Some say he rests there still, hidden in the temple’s attic! 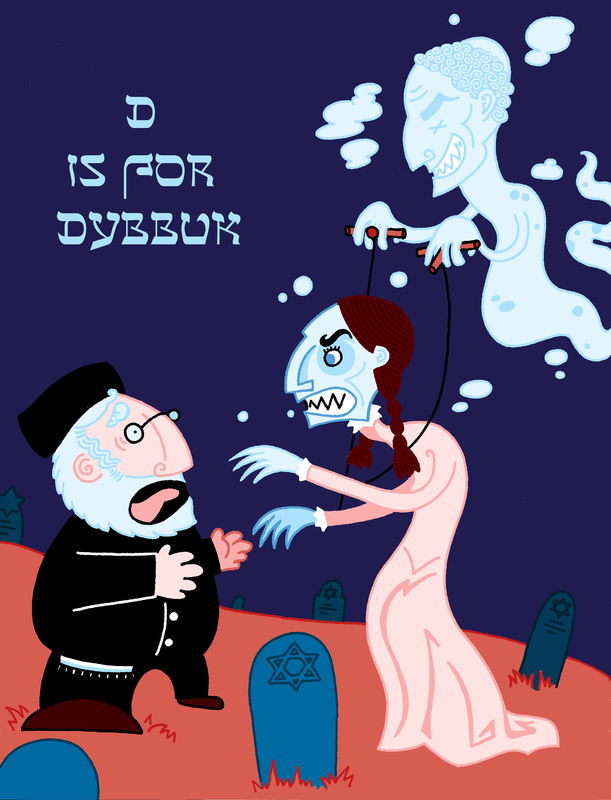 In an earlier version of this piece, the Golem had a little rabbi accompanying him. 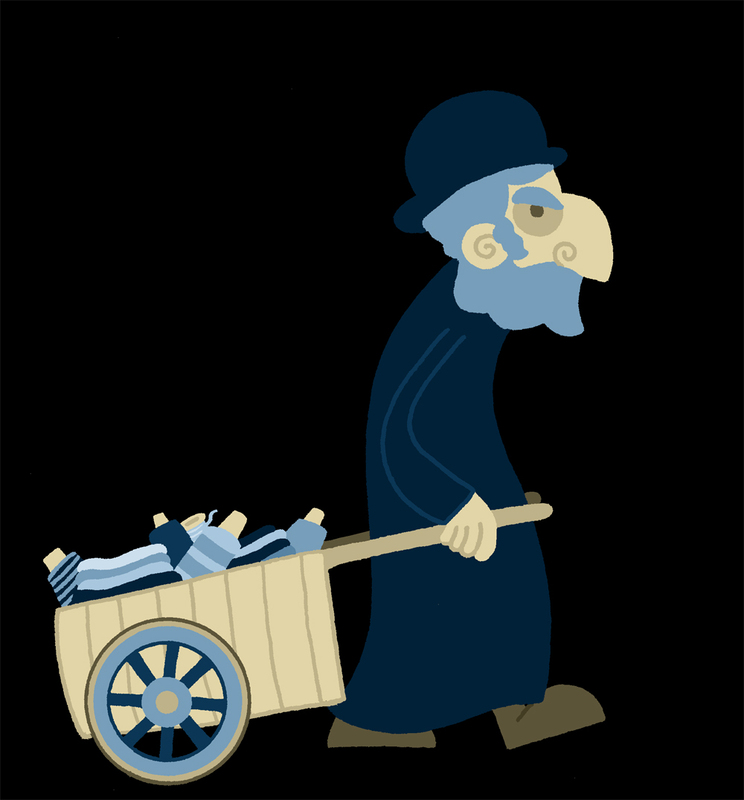 I really liked the rabbi, but the picture, already a little busy, just felt too crowded with him there. Maybe I’ll post an alternate version later though, see if y’all agree. 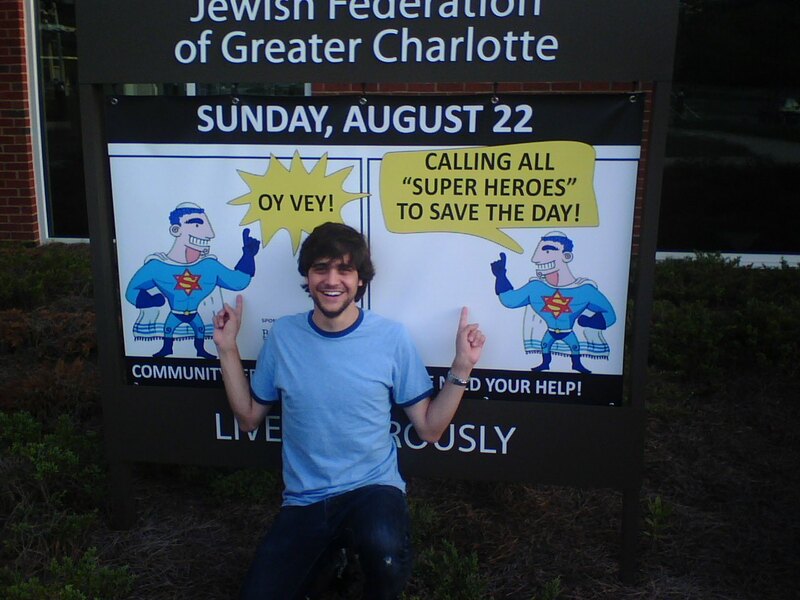 The Jewish Federation of Greater Charlotte is using my super hero character as a spokesmensch in their “Super Hero Sunday” fundraising campaign! Someone told me today that you can see him all around the Charlotte JCC, so I went over this evening to take a look. Here’s a picture of the proud papa. 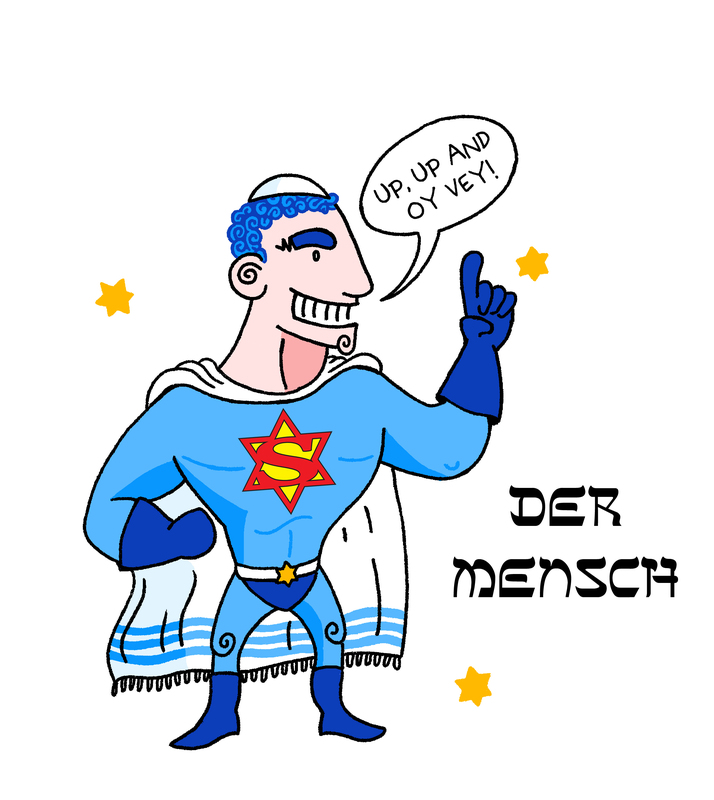 I love the way we color coordinate, Der Mensch and I.
I’m sorry to say that I won’t be making regular updates for the next couple of weeks. I’m going to be traveling to Israel on the Birthright program and am not sure when, or if, I will have the opportunity to post my work. If I have occassion to do so, I will keep posting pages from the “Mockingbird,” as I have a lot of that stored up. The “Heads of State,” though, I draw on the days that I post them, so the cartographic carricturing will not resume in until mid-July.